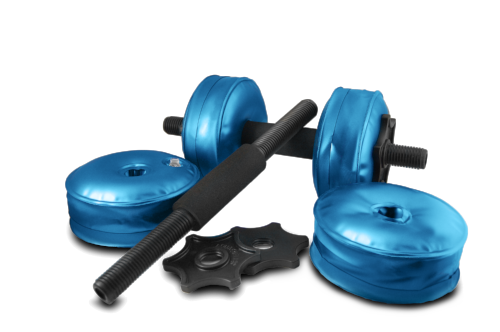 The set of AquaBells Minis Dumbbells weigh less than 24 ounces and are so compact that they can fit into a briefcase. It's easy to fill with water at your destination, and these innovative weights can provide up to 8 lbs. of resistance per dumbbell. Fill the weights to your desired weight resistance and secure them on the cushioned bars. When it's time to pack AquaBells, they empty in seconds. Work out in the privacy of your hotel room, home, or office. Guaranteed not to leak. 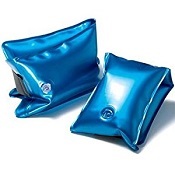 Great for physical therapy, and also can be used for water resistance programs when in swimming pools, too! The set includes two 13" long bars, with soft cushioned grip handles, with eight fillable AquaBells. These Dumbbels are soft sided and can prevent injuries that might occur with metal,or steel equipment when used by children. Caution on the weight they are filled up to for children - consider age and strength of the child. *Use under adult supervision. Includes Two Dumbbells, adjustable up to 8 lbs. each, with eight water chambers. Soft cushioned grips for comfort. Weighs only 24 oz. when collapsed. 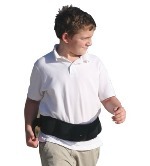 Made of soft vinyl and injected-molded polystyrene and gentle on the skin.